Everyday living expenses by sharing in the cost of the family cell phone plan. The power of compound interest by paying them an aggressive parent rate on savings. The cost and pain of debt via a parent-issued loan for a big ticket item, like a laptop or a phone. Patient, low cost, diversified investing via index funds held in a Roth IRA as teens. It’s so short, I could KISS it! 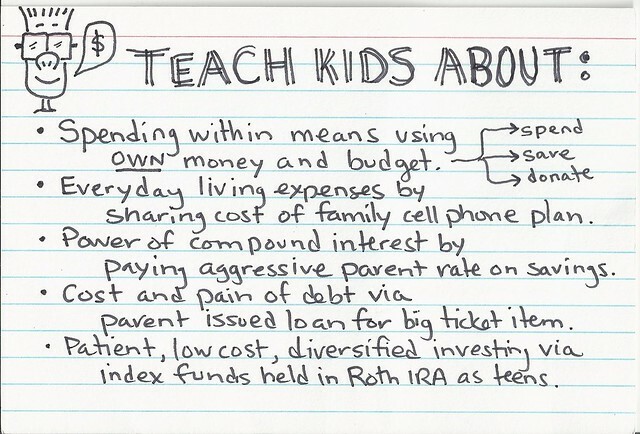 What would you put on a Money Mentor Index Card for your kids? Your card is a good start Bill. I'd include the power of having a plan for your money and an emergency fund. Love it! Hadn't thought of #4 before, but that totally makes sense. Thanks! Thanks for stopping by, Robert. Yes, many parents abide by the rule: "never lend money to your kids" for fear that it will teach them to spend money recklessly before they have it. I think that's a good rule for everyday purchases, but paying off a BIG loan occasionally is actually a great learning opportunity and experience. With some prior experience, they won't be caught off guard by (or be complacent with) their first big loan (car/home/student) as an adult. The earlier the better, its awesome that you are teaching them all this. They will be prepared for the real world and ready to take it on! Bill, We feel our free website MyCheQueMate.com (which helps parents teach kids about the concept of money, how to earn it, spend it & save it) dovetails nicely with your list with the possible exceptions of #3 & #5. The concept is similar, parents are the bank owners while kids are the bank's customers. And our bank is called My Family Bank & Trust.